At N.L. Basement Systems, we specialize in the unique problems that below-grade spaces present. Our installations include a written, transferable warranty that will provide you with long-lasting peace of mind. You don't have to solve your basement flooding problem on your own! Our team of professional waterproofers is standing by to provide you with a customized, warrantied solution. To schedule a free, no-obligation basement waterproofing quote with one of our specialists, contact us by phone or e-mail today! 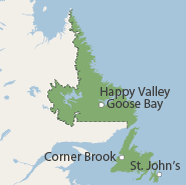 Our Newfoundland and Labrador service area includes Gander, Conception Bay South, Corner Brook and many surrounding areas nearby. Water can flow through the hatchway and down the stairs even when a sump pump system is installed. In this article, we explain why this kind of flooding occurs -- and how to prevent it.